Remember when you could do anything and not worry about a thing? What about the days when you had no idea what aches and pains were other than words. It’s time to get back to basics and take control! For less than the price of lunch you can have relief from the agonizing torture associated with Plantar Fasciitis! 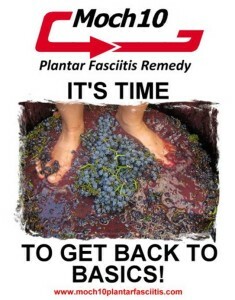 Give our MOCH10 Plantar Fasciitis remedy a try! We have hundreds satisfied customers and back up our claims with 100% MONEY BACK GUARANTEE! ← Does Shopping Have You Hopping?